Benjamin Franklin is reputed to have attached a metal key to the bottom of a dampened kite string and flown the kite in a storm-threatened sky.A succession of sparks jumping from the key to the back of his hand showed that lightning was indeed electrical in nature.Never, he had imagined that same kite would be used to generate electricity on its own. We all know about traditional windmills.Whenever, I saw windmills ,I know, there is lot of scope in designing improvement. But, before Makani Power , I had never imagined, that improvement would be of that sort which changes windmills altogether.With Makani Team’s great imagination and innovation with funds from US Government and Google.Org, power can be generated using kites connected through wire from the base. 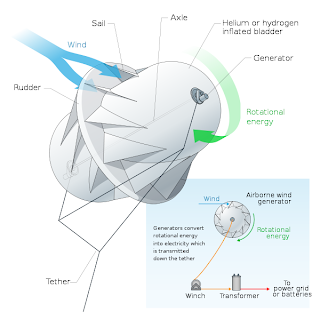 These types of wind turbines are known as Airborne Wind Turbines.An airborne wind turbine is a design concept for a wind turbine that is supported in the air without a tower.Airborne wind turbines may operate in low or high altitudes; they are part of a wider class of airborne wind energy systems (AWE) addressed by high-altitude wind power. This project would be a great milestone for Aeronautical , Mechanical and Electrical engineering students and I would strongly recommend you to study more about what Makani Power is trying to achieve and about their concept. The Makani team has achieved a significant milestone in the pursuit of inexpensive renewable energy during a recent flight of its latest prototype, Wing 7. Wing 7 has a wing span of 8 meters, weighs 58.4 kg and has a rated power of 20 kW. We gather at EnergyKiteSystems in the net sector. Over 800 stakeholders and hundreds of methods. Free forum.